From Inner to Outer: Digression: Books I'm Reviewing—Douglas Coupland's "Worst. Person. Ever." 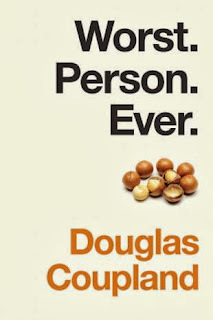 Digression: Books I'm Reviewing—Douglas Coupland's "Worst. Person. Ever." Aside from books (Herbert, Tolkien, Asimov, er, John Wyndham, Franklin W. Dixon, Enid Blyton's Secret Seven series, and Helter Skelter) and comics (Flash, Justice League, Green Lantern, etc., basically anything with super-villains and super-powers), I read and re-read stacks of Cracked and Mad Magazine as a child. While I can't remember much about individual issues now, one random set of cartoon panels has stuck in memory. The "Before" shows the cast and crew on the set of a comic film breaking up with laughter. The "After" depicts a cinema audience of that same production completely stone-faced at the supposedly funny antics on screen. I bring that up because my response to Worst. Person. Ever. mirrors those patrons in the Mad Magazine cartoon (despite the fact that the novel's presumed starting point, a story called "Survivor" that Coupland published in 2009, is both cynical and despairing but also terrifically funny). If nothing else, the crazy division of opinion about the novel indicates the subjective nature of taste and humour. Ditto for the perennial Big Question: "What constitutes a good novel?" The review in the Independent, for example, concludes that the novel "reads like a failed experiment; a misjudged one-off," while the Guardian's reviewer notes: "Novels are no longer about thinking, they're just vortices of cliche. The race is now on to write the Worst. Book. Ever. And this may be it." More locally, these final words at the Winnipeg Review: "Perhaps the novel would be better, or at least more entertaining, if it were read in spurts, or portioned out as a series of ribald vignettes to mull over. Like Raymond Gunt himself, Worst. Person. Ever. can bring many a horrified chuckle to a person’s lips. Also, like Gunt, a little goes a long way." The Globe reviewer, in contrast, refers to Coupland as an "ideas man," and finds the novel brilliantly insightful. At the Quill and Quire reviewer sees a winning books that's "flashy, loud, a bit unsettling, and screamingly fun." My review appears in The National Post.